I have a sweet tooth, well actually, I also have a savoury tooth. I generally just love food! But I also love being healthy and fuelling my body well for a healthy and active life. I like to ‘treat’ myself from time to time, but treats don’t have to be unhealthy. Below is a great pancake recipe I made this week. Super delicious, packed full of protein and good for you! Place a frypan on to a hot stove top and grease lightly with canola oil. Whisk banana, egg whites and cinnamon together using a whisk or a bullet machine (such as a ‘magic bullet’). Pour small amount of mixture in to pan to make one pancake and allow to cook for 1 minute. Flip and cook on the other side. Repeat. While the pancakes are cooking, defrost frozen berries in the microwave for approximately one minute. 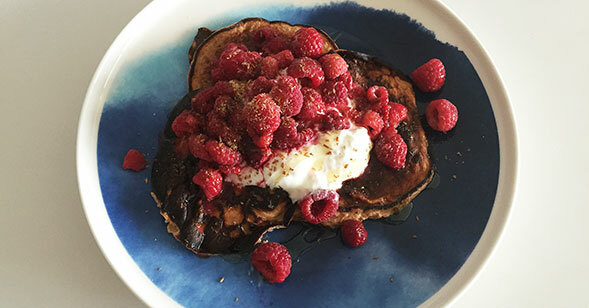 Place pancakes on to a plate, top with frozen berries, yoghurt, flaxseed meal and drizzle with honey. You can also make just one large pancake with the mixture. Give it a go for a healthy ‘treat’ breakfast this weekend!